USUALLY dust isn't a good thing, but the fine layer covering the Australian flag which will fly at a special Armistice Day service tomorrow carries a special significance. 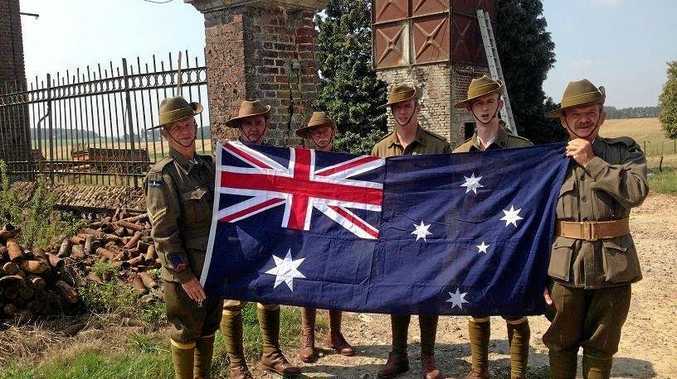 The almost imperceptible addition to our flag is the result of a two-week trek in the footsteps of Australian diggers by a group of Rockhampton men dedicated to keeping the memory of those fallen troops alive. The dust of the Western Front was carried back by the members of the 9th Battalion AIF Living History Unit after its journey through French villages and spots of significance from the First World War. Tomorrow, the group will carry out the annual Remembrance Day service at the John Leak Monument on Huish Dr. This year there is added significance, with 2018 marking 100 years since the signing of the armistice between Allied and German forces to end World War I. 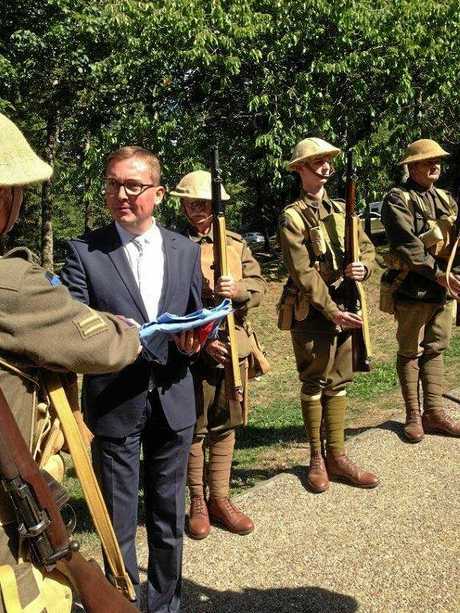 The Living History Unit is still on a high after its triumphant journey to Europe, travelling at the invitation of the French government along the Western Front. 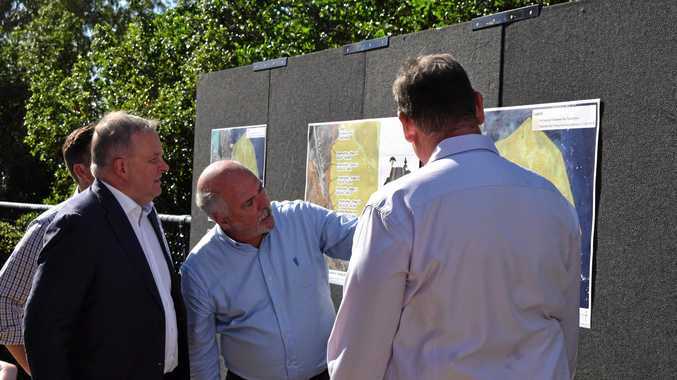 The group has become well-known around Central Queensland for its painstakingly detailed approach to honouring our diggers. 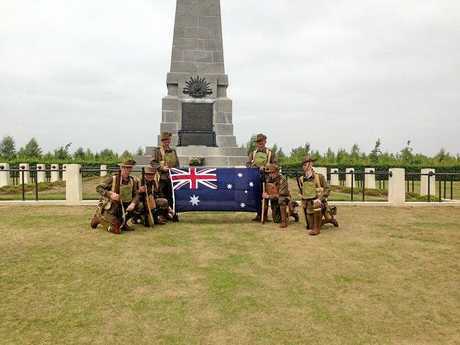 It has become a mainstay of the Emu Park Anzac Day dawn service, and it was a viral photo of its rifle volley which secured their European trip. 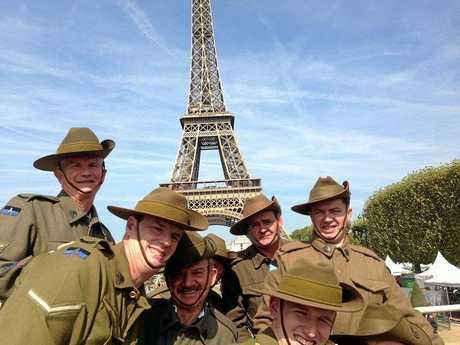 A Victoria Living History group, which was approached by the French government for the August 2018 centenary commemorations, suggested the Rockhampton troupe for the tour. Living History Unit's David Bell said both the official ceremonies and off-duty activities were unforgettable. The group was part of official ceremonies in Fromelles, Pheasant Wood, Pozieres, Mouquet Farm, Hill 60, Polygon Wood, Passchendaele, Menin Gate, Bellecourt, Villers-Bretonneaux, Ypres, Peronne, and Verdun. The Verdun re-enactment made international headlines, with the Living History Unit among 18 nations represented in the re-created military encampment. The ceremonies were held in August to take advantage of the European summer, but were held to mark a centenary of the end of the war. Entire villages were wiped out and hundreds of thousands of soldiers were killed in the 10-month battle at Verdun, the longest in World War I. It is estimated 60 million shells were fired between February and December 1916. The volunteers did not re-enact fighting out of respect for the peace which these battlefields now symbolise. "By no means, have the people of Belgium or France forgotten what happened over there," Mr Bell said. "They all instantly recognised the slouch hats. "It was all nationalities. It was in remembrance of the soldiers. It wasn't about the outcome really, it was about what happened." Jacob Withoos, the youngest Living History Unit member on the trip at 19, told Associated Press at the service that everyone was gathered for remembrance. "War is never a good thing and we must ensure it doesn't happen again. It's great to have things like this so we can remember the men who sacrificed themselves in order to preserve freedom, and definitively ensure it doesn't happen again to any future generation," Mr Withoos said. 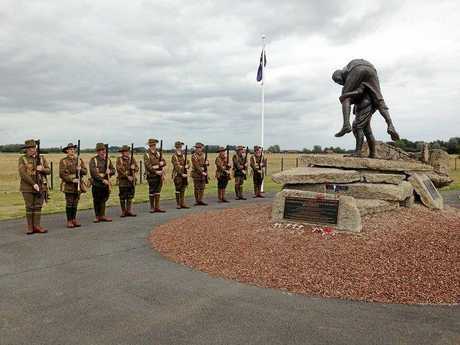 As moving as these official occasions were, Mr Bell said it was the little moments such as playing cricket in a field off the motorway or singing Waltzing Matilda as they marched through French villages that made the group feel even closer to the thousands of men who had over 100 years ago done the same without knowing whether they would make it home. Tens of thousands wouldn't celebrate a return to Australia, and tens of thousands more would be listed as missing, leaving families with no closure and the heart-wrenching hope that their loves ones might one day come home. Mr Bell said the visit to Pheasant Wood, where seven previously missing Australian soldiers were recently buried, was made all the more poignant when the group later saw the memorials to the missing where those soldiers' names had been removed following their discovery. The group also stayed overnight in a trench re-created from the Christmas Truce, where it is said troops put down their weapons to sing carols and play sports. Mr Bell said airline luggage restrictions proved challenging for the group's historically accurate uniforms, but they didn't even attempt to take their replica weapons knowing what a hassle it would be trying to get through customs with rifles and bayonets. Instead, British living history volunteers brought weapons with them to France for the group to borrow. Ironically, many of these turned out to be Australian firearms. Mr Bell said the group were continually impressed and amazed by the hundreds of people they met during the trip who were paying homage to fallen soldiers. He said mementos of all varieties could be seen in every cemetery, honouring the men who never made it home. The Australian flag Capricornia MP Michelle Landry presented the group before they left was carried proudly throughout the journey, and will tomorrow replace the one which usually flies in Huish Dr in a nod to the group's time abroad.